Kathy S. Palmer Blosser, who just turned 49 on August 14, 2018 drifted off to Heaven on August 15, 2018 while at the James Cancer Hospital in Columbus, OH. She was born in Bellefontaine, OH on August 14, 1969, a daughter of the late Robert “Feeney” Palmer Sr., and Mary “Coni” Palmer, who survives in Michigan. Kathy attended Indian Lake High School and graduated in 1988 from Bellefontaine High School. Kathy married Dean Blosser and later divorced. She then moved to Orlando, FL, where she had resided for the past 27 years. 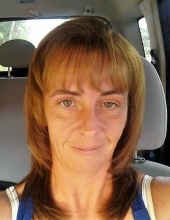 Kathy was employed by DOT of Florida until her illness in 2016 that eventually brought her back to Ohio in February 2018. Kathy was a loving mother of two daughters, Carrie (Tony Ramos) Blosser, and Stephani (Abner) Gonzalez, and a son, Jonathon Wingo. She was also a proud memaw of four grandchildren, Isaiah, Amelia, Julius, and Breanna, and expecting a new grandson, Adonnis, in November. She is also survived by a sister, Carla (Rick) Nolan of Bellefontaine, and two brothers, Robert (Rhonda Hamilton) Palmer of Russells Point, and Larry (Amanda) Rosenburg of Michigan, and a special sister-in-law, Lesa Palmer. She has numerous nephews and nieces and a special niece, Jami Ferguson, whom she called her “baby girl”. Kathy was preceded in death by her maternal and paternal grandparents, her father, two brothers, James Rosenburg and Kenneth Palmer, and a niece, Kristi Nolan. Kathy’s wishes are to be cremated so she could have a “smoking hot body one more time”. A celebration of her life with Rev. Bryan Meadows presiding will be at 3:00 pm, Sunday, August 26, 2018 at Shoffstall Funeral Home, 205 S. Main St. Lakeview, where family and friends may come one-hour prior. Inurnment will be in Huntsville Cemetery at a later date. In lieu of flowers, memorial contributions may be given to her family in care of Shoffstall Funeral Home. To send flowers or a remembrance gift to the family of Kathy Blosser, please visit our Tribute Store. "Email Address" would like to share the life celebration of Kathy Blosser. Click on the "link" to go to share a favorite memory or leave a condolence message for the family.